This entry was posted in Blog, photography and tagged 2016, clouds, evening, Photo of the Month, santee, santee lakes, santee lakes recreation preserve, sunset on January 31, 2016 by T.M. Schultze. Oh no, my rainbow is gone! That was all she wrote. A little nice light right at sunset, but the clouds were too low to light up after 15 minutes. This entry was posted in Blog, photography and tagged clearing storm, cowles, cowles mountain, mast blvd, mission trails, rainy, santee, santee lakes, windy on January 31, 2016 by T.M. Schultze. This entry was posted in Blog, oa on January 31, 2016 by T.M. Schultze. Tonight, the January 29 sunset from Santee Lakes was spectacular. By this time of year, I am getting home from the office with time to spare to catch the last light. The high clouds this afternoon looked like they were setting up perfectly and it did not disappoint. Because Santee Lakes closes at 5 PM this this of year, I don’t have time to enter the park and shoot inside. However, the Mast Blvd bridge is a perfect vantage point overlooking Lake 2. You have a wide view of the park, Mission Trails and Cowles Mountain, as well as plenty of water and sky to balance the image. My home is near the corner of Fanita Parkway and Mast Blvd, and there are a couple other overlooks that provide nice views at sunset. It really is amazing how much of a difference the winter season makes for the light in Southern California. These high clouds are amazing, and maybe not an unusual sight in areas closers to the normal path of the jet steam, but they aren’t always prevalent in Southern California. Below, I have included a gallery of several images taken in several overlooks and in different image orientations. I believe the Sunset in landscape from Mast Blvd is the best. Let me know if you have a preference! As always, I thank you very much for reading, and I hope you enjoy the images! This entry was posted in Blog, photography and tagged cowles mountain, fanita parkway, mast blvd, mission trails, santee, santee lakes, sunset, winter on January 29, 2016 by T.M. Schultze. I love to make infrared images, but late last year, my trusty infrared sensor camera died. I didn’t realize how much I missed making these photographs! Most people know that the visible light spectrum is only a small part of the full light spectrum in the universe. The full range of the electromagnetic spectrum spans from extremely low frequency radio waves to gammar ray radiation. What the human eye can see spans a very small set of frequencies and wavelengths between near infrared and near ultraviolet. You don’t need a lot of technical know-how to realize that infrared images are very interesting! The color cast has an otherworldly tint, and some people like my friend and colleague Jeremy Long use these images to make very deep and contrasty black and white images. I feel the need to replace that camera! While you can simply buy a filter for your camera lens, those images require very long exposures to block all visible light. Any moving subject can then be problematic. It is alway preferable, albeit more expensive, to find a second-hand DSLR that has an infrared sensor added to the camera. Thank you for reading, and I hope you enjoy this small selection of images! This entry was posted in Blog, photography and tagged electromagnetic spectrum, infrared, mt rainier, reflection lakes, visible light on January 26, 2016 by T.M. Schultze. I am was on the way to Phoenix yesterday morning, so I spent a quick Morning at Imperial Sand Dunes. On Interstate 8, out of El Centro, I was headed East when I found that good light was already hitting the clouds and I started planning for a good place to stop. I decided to try the Imperial Sand Dunes off Grays Well Road. I also enjoy this stopping point because Grays Well Road is a portion of Old U.S. Highway 80. The old Plank Road also existed prior to Highway 80’s christening in 1926, and was a set of wooden planks that were set over the dunes to allow vehicular travel to clear the dunes without getting stuck. The glow from the high, light, clouds had amazing hues or red, pink, purple, and orange. The strongest colors existed much more than 15 minutes before sunrise, and I was quite pleased with the results. As the twilight morning grew closer to sunrise, the colors because much more muted, and eventually washed out. This isn’t the most ideal time of year to photograph the Imperial Sand Dunes. This is ATV season, and it is hard to look anywhere without seeing tire tracks everywhere. In a way, I think that still makes for good images though, because it does show a time and place for these dunes, and people can immediately guess where and when the image was taken, as well as provide some perspective for how these particular dunes are enjoyed by the public. This entry was posted in Blog, photography and tagged algodones, california, grays well road, imperial sand dunes, plank road, sunrise, twilight on January 24, 2016 by T.M. Schultze. Seriously, just buy this book! 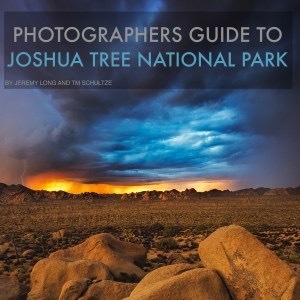 Recently, I co-authored the Photographers Guide To Joshua Tree Natuonal Park with my long-time friend and colleague, Jeremy Long. We decided to use Facebook Advertising to make sales. One of the challenges in our first experience with self-publishing is simply letting the world know our book exists. Jeremy and I both have Facebook Pages for our photography. This would be a great start, if not for Facebook’s notorious algorithm. Facebook architects the Pages in a manner that appears to push users to favor Boosting posts, which costs money. For that money, we essentially got views and Likes, none of which actually succeeded in selling our offering. Jeremy and I both took care to target our audience. I targeted people from mid-20s to late 50s with an interest in Joshua Tree, photography, California, and San Diego (since that is where I live). Jeremy expanded his audience to people with photographic interest from Europe, since Joshua Tree gets a lot of tourists from across the pond. Is it possible out ads were subpar? I suspect they were okay, judging by a lot of similar sponsored content I see on Facebook. I have no issue with advertising and do not begrudge Facebook the right to sell advertising. With a reach past 1 billion users, the possibilities to reach a huge audience are incredible. I do question the value of Facebook advertising though. Large corporations and organizations can still reach a vast audience with such low rates of Likes, Clicks, etc. Small businesses don’t seem to have the same ability because of the dreaded Facebook algorithm. Our next stop is a few buys with Google Adwords, and I look forward to posting the results. This entry was posted in Blog, Technology on January 14, 2016 by T.M. Schultze. This week, the El Nino weather system has really hit Southern California. While most people were heading for cover, I knew that there would be small openings of really dramatic weather. Heading home from the office, I knew I had hit the jackpot. I was armed with my backup camera body due to my recent camera accident, and I was using my Nikon 20mm 1.8 lens on a crop sensor, so it really was about a 30mm equivalent on a full-frame system. Lightroom’s recent addition of the panoramic export is excellent, and with less than ideal equipment, this was a great opportunity to use it! The resulting image was a 28 image panorama that Lightroom had no issue stitching together. As you can see, the last light as the huge, high, clouds towered over Santee Lakes was amazing. The yellows on the high clouds got deeper and deeper just after sunset, before the light vanished all at once! Those are the brief moments that build memories. As always, it is great to own your own backyard, and have a good, quick, place to go when you are at home and the light sets up perfectly. This view is from the Mast Blvd bridge look North over Santee Lakes 2 and 3. The clouds to the South of the bridge were dark and gloomy, which could have been a different but interesting image. I wanted to chase the light though, and the opening to the North was too much to pass up. It still amazes me how much people miss the connection between so-called bad weather and the resulting images. Be safe, but get out there and brave the elements! your portfolio will thank you. Thank you for reading, and I hope you enjoy the image! This entry was posted in Blog, photography and tagged california, el nino, lightroom, nikon, panorama, san diego, santee, santee lakes, sunset on January 7, 2016 by T.M. Schultze. This entry was posted in Blog, photography and tagged bridge, california, clouds, el nino, mast blvd, san diego, santee lakes, storm, sunset on January 5, 2016 by T.M. Schultze. This entry was posted in Blog, photography and tagged 2016, coronado islands, hippies, hippy, kristan wagner, natural park, new year's day, no surf beach, overlook, point loma, san diego, sunset cliffs on January 2, 2016 by T.M. Schultze.